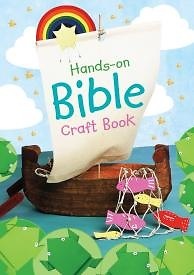 Bring Bible stories to life with this junior craft book of sixteen activities for children who like to keep their hands busy. Activities include a rainbow mobile (Noah), origami frogs (Moses), a lion mask (Daniel), an Easter garden, Pentecost kites, and a platter of Bible food. The activities are designed so that younger craft workers can gain pleasing results, while being open-ended enough to occupy even the most dexterous.